Discussion in 'Football Recruiting' started by osugrad21, Jan 7, 2013. This is the only forum on this site where we ask posters to follow a few simple rules. These rules are in place due to the frequent visits from parents, coaches, and the players themselves. Therefore it is imperative that we respect these visitors and portray the site in a positive light. 2) Absolutely No bashing of a recruit...regardless of his choices, we will not partake in the bashing of a 17 year old kid. 3) Do not post Premium Info from other sites...summaries with a link are as far as we can legally go. Do not Cut and Paste from Scout/Rivals even if the article is free. Summarize and link just to be safe. 5) Do not try to contact or influence a recruit on this board....While it is acceptable to relate the strengths of The Ohio State University in a general way, please do not cross the line and start begging, pleading, cajoling, etc. recruits to become Buckeyes. Not only is such conduct often counterproductive (the school and the football program should be able to "sell" themselves, and the coaching staff doesn't really need your help), it could also be a violation of NCAA recruiting rules. All "open letters" to recruits will be deleted. Simply, if you tell a recruit he needs to be a Buckeye because of X, Y, and Z...you are crossing the line. 6) Negativity about a recruit, although not bashing the player, needs to be handled with care. There is not a problem with stating feelings about a recruit's possibilities of going elsewhere. However, please make sure that the post fits into the flow of conversation. Opinions will vary following various updates and are welcome in the forums. This, however, does not mean a poster should make a definite proclamation out of the blue or consistently interject their negative thoughts over and over. If you are convinced of a player going elsewhere and are not involved in the updates being provided, simply read the thread and pass on the posting. 7) Don't post things like "Anything new?" or "Anyone hearing anything?" or any variation of the sort......When info or news is available, we will post it. 8) Visitors, we respect your outside perspective, but if you are here to spew propaganda for your team, you will not last long. The hijacking of threads to spout off about your team's chances/why your school is the logical choice ends now. For the BP crew, please do not allow yourself to be drawn into the discussions that take away what we have built here. 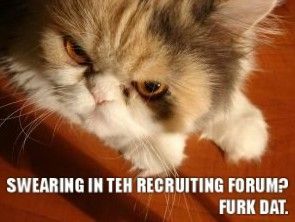 If someone is not following the high standards we demand in this recruiting forum, let a mod know and it will be handled immediately. 9) When posting news, please include a source. For the most part, this is preaching to the choir...but for the folks who haven't been around here for very long, we do things a little differently when it comes to recruiting. We are news first and primarily...discussion second. Player threads are for that player. We realize that discussion sometimes take off on tangents...we do our best to split things off...but please put forth an effort to stay on topic. The ledge jumpers, "I hope we get ___________," and the folks too lazy to read a thread for recent news (instead of just repeating or reiterating a question) are likely better off not posting here. If that is asking too much, sorry but that is how we have done things and how we will continue to do things. All mods have been asked to start handing out infractions for those who just won't cooperate. Hopefully, we won't need many to get the point across. If you have any questions or concerns, PM one of the Mods or Admins for clarification. leroyjenkins, MD Buckeye and MililaniBuckeye like this. 10) When posting news, please include a source. Krenzelicious, NJ-Buckeye, Fungo Squiggly and 1 other person like this. brodybuck21, Krenzelicious and AuTX Buckeye like this. Bump, especially for the language recently. brodybuck21 and NJ-Buckeye like this. Been awhile....bump. There are rules to follow here. Also memes that have profanity, suggestive/graphic sexual content, or other obviously offensive content. MD Buckeye, brodybuck21 and maximumblitz like this. LitlBuck, brodybuck21, NJ-Buckeye and 2 others like this. Bump. Rules #2 and #6 are pertinent to what has been going on today. Feel free to suggest that a kid has a particular on-field skill that they need to improve, but negative criticisms of kids' attitudes/behavior/character aren't welcome here. brodybuck21, jakenick06, Nigel Tufnel and 3 others like this. Bump. In light of the head coach change, we're not going to bash those players deciding to move on to another school and/or explore other options. Abenaki, RB07OSU, Fungo Squiggly and 2 others like this.